The plan: one week, one city, three hockey games, one practice and as much else as we could pack into the week as possible!! Guess what? The plan worked!! 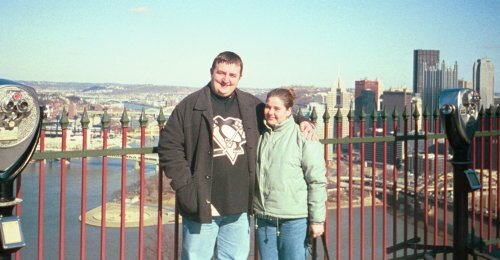 I had used the line that it would be a trip of a lifetime to go to Pittsburgh and watch the Mario-led Penguins play to persuade the wife to go......I was right!! We set off at 4am from my parents house to the airport to get booked in for the 6:40 flight to Paris from where we would fly onto Newark and then, eventually, Pittsburgh!! The omens for the trip weren’t looking too good when we were told at about 6:30 that the flight would be delayed four hours because of a crew shortage!! We eventually got moved onto a different flight direct to JFK in New York and an onward flight from there to Pittsburgh. 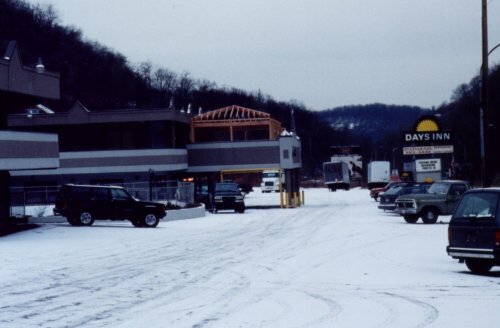 After a total 19 hours of travelling, including a mad dash across JFK airport to catch our connection, we finally arrived at our hotel and base for the week - the Days Inn Pittsburgh. We got into our room flicked on the TV just in time to catch the face off of the Penguins-Blue Jackets match from Columbus. The ideal start to our time in Pittsburgh!! We unpacked, keeping one eye on the screen and once finished realise how cold the room was!! However, in our jet-lagged state (it was about 2am UK time) and with our only other experience of the States being a fortnight in Florida, we didn’t realise the air conditioner under the window also gave out warm air - DOH!! So, we got in bed to watch the game and promptly fell asleep, missing most of the action!! After a quick driving tour of the downtown area we headed for the river and Mount Washington. 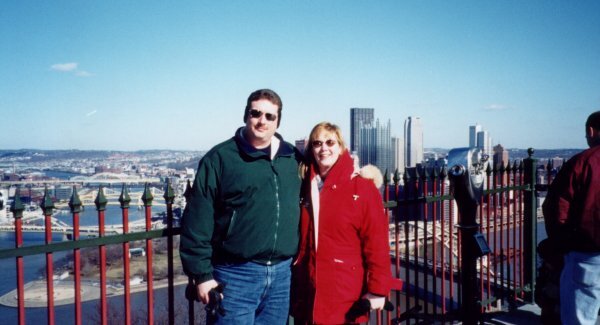 We travelled up the side of Mount Washington via the Monogahela Incline (a cross between a train and cable car!) and then walked to the Grandview Saloon where we dined looking out over the river to the best view in Pittsburgh (see picture below). A trip down the second incline, the Duquesne Incline, and a walk back along the river bank and we were back at the car. A short hop across the river later we were in The Point State Park (where the two rivers meet) - just a shame the museum wasn’t open so we could get caught up with the history of Pittsburgh.... And then, all too soon, our first fabulous day in Pittsburgh was over and our friends dropped us back at our hotel!!! Many thanks have to go to John and Helena for showing us a brilliant time on our first day and setting us up for the rest of the week - thanks you guys!!! 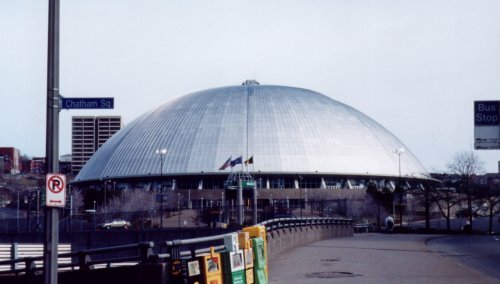 The next day, Monday, was the day of our first game, a 3pm face-off against Colorado Avalanche so we headed downtown on the bus and headed for The Igloo for the first time. It’s a pretty impressive building when you get up close, especially with the sun glinting off the metallic dome. The three games we went to and my reaction to watching NHL hockey is covered in the Hockey Night In Pittsburgh section - see links at bottom of page. 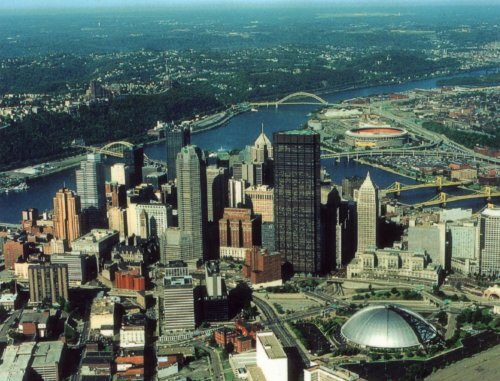 and a wander round the South Hills shopping mall followed by a ‘T’ (Pittsburgh’s tram system) trip back to downtown and dinner at the Grandview!!! The trip to the Penguin’s practice and my encounter with a personal hero are covered in more detail in The Day I Met Mario and Meeting The Pens sections of this feature. The rest of the week was basically taken up with shopping during the daytime, both downtown and at the Station Square complex, and attending the games in the evening. Apart from, that is, the Thursday evening where, to thank them for their guided tour on the Sunday we met up again with our friends for dinner and an unplanned 10:30 pm trip round Wal-Mart in Washington, Pennsylvania - again, Thanks Guys!!! And then, before we knew it, and just as we were getting settled, it was Friday night and we were at our final game on our final night in Pittsburgh. We had done most of our packing that afternoon so that on the Saturday we could get up, get ready and leave for the airport with no mad panic ensuing. Our time in Pittsburgh was coming to an end but not without one last sting in the tail!!! Although the trip started and ended badly the time I spent in Pittsburgh was, and always will be, one of the best weeks of my life and the people we met (Hey Denise and Mel K!!) were brilliant. Please check out the rest of the feature via the links at the foot of each page!! !